'Tis the season for holiday festivities, timeless family traditions and... moving? 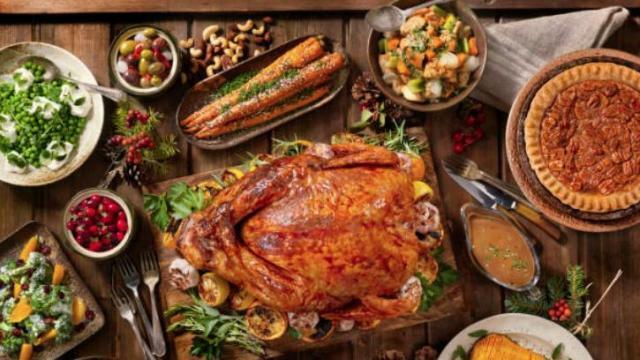 Yes, some families are on the move this Thanksgiving and nervous moms are wondering how to provide usual highly anticipated Thanksgiving feast without all the fuss and without unpacking the already bubble-wrapped cookware. Thanksgiving can be classy and affordable without all the stress of basting, roasting or smoking your annual turkey. If you expect a larger family gathering, Boston Market is a great choice for parties of as many as twelve people. Enjoy a whole roasted turkey, creamy mashed potatoes with gravy, of course, veggies, stuffing and rolls as well as an appetizer dish while lounging through a leisurely dinner with your loved ones. To celebrate your stress-free mess-free holiday, enjoy Boston Market's pumpkin and apple pies. Be sure to call them today as their supplies are limited. Be prepared to spend approximately $120. For a more upscale crowd, consider Williams Sonoma's complete turkey dinner for $369. Once again, this meal serves up to twelve and includes the usual. The classy part: butter and chive mashed potatoes and green bean casserole floating in a Gruyere cheese sauce, topped with sauteed shallots. Don't forget to leave room for the pumpkin pie! Related: "6 Tips for a Tantrum-Free Holiday Feast"
For those who wish to gorge without guilt, Whole Foods is a great option! From two to fourteen, Whole Foods is prepared to cater to groups of all sizes and offers a myriad of holiday meal options. From traditional to vegan to building your own holiday basket, the starting price point is $59.99. Nothing says warm, cozy, family holiday meal like Cracker Barrel. Invite country cooking into your home this year with Cracker Barrel's Turkey Day Kit which services ten people for the reasonable price of $109. This particular kit includes the usual homestyle food choices and can be heated and served in two or or less hours. For those who long for the simple life, consider the fully prepped holiday feast with all the usual sides, including a pecan or pumpkin pie and fried apples. While pricing varies depending on location, Cracker Barrel is one of the more financially reasonable choices this year and orders must be placed 24 hours in advance. If you really want to go wild and host the party of a lifetime, Buca di Beppo serves gatherings of as many as twenty guests. While they offer a more limited menu, you can still expect the usual American choices and a very full stomach. For smaller groups such as a family of three, Buca offers a Thanksgiving To-Go meal. Catering selections begin at $68.99. For those who just can't bring themselves to sit on the sidelines, consider Martha Stewart's Thanksgiving Day Box or the HelloFresh Thanksgiving Box. For chefs who still wish to create their own Thanksgiving meal experiences, Martha's feast will set you back a minimum of $159.99 and HelloFresh has meal kits starting at $99. Regardless of how food is prepared, remember that Thanksgiving is about being grateful for that which money cannot buy. While everyone loves food, remember what really matters and enjoy the company which surrounds you.